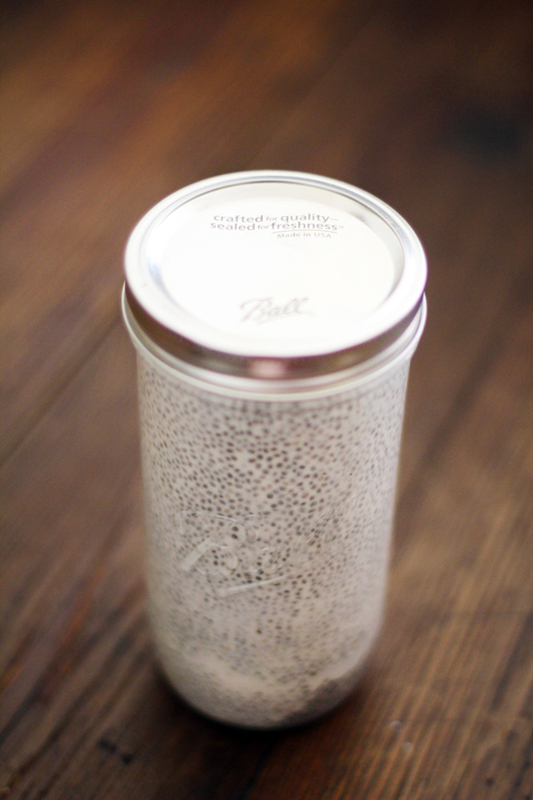 With chia seed pudding, all you need is your ingredients and a jar -- no cooking required! Simply mix your ingredients together, and let it sit in the refrigerator overnight. During the fall and winter months, I love desserts with maple and walnuts. The cozy combination makes for a delicious, satisfying treat. 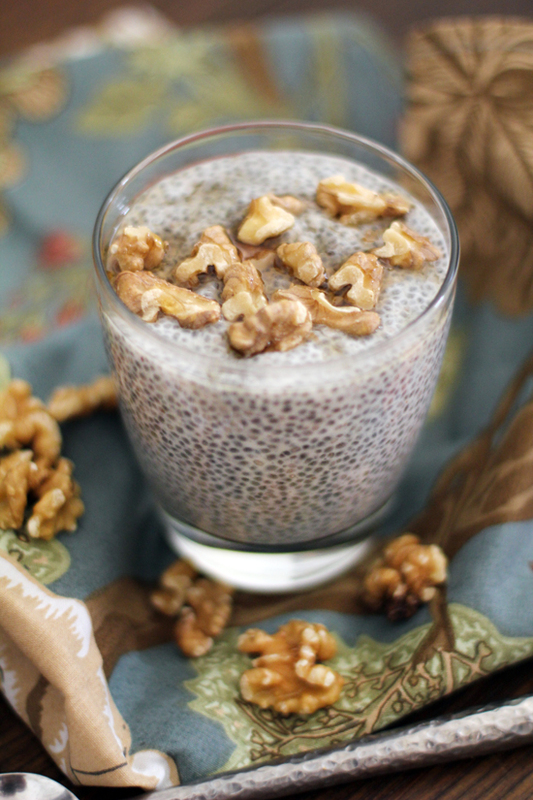 Chia seed pudding is one of the easiest and healthiest desserts and can be made in seconds, and this Maple Walnut Chia Seed Pudding recipe is a staple in my household. For those who have never tried chia seeds, here is what you need to know: chia seeds have a higher density of omega 3 fatty acids than flax seeds, are full of anti-oxidants, minerals, and are a natural anti-inflammatory. They are grown and widely used in South America and have been a natural medical resource for centuries. When soaked in liquid to make pudding, chia seeds form a gelatinous substance around them, making them similar to tapioca. The consistency turns out thick and creamy and the seeds provide a great, poppy texture. The natural health benefits make this dessert fit to be eaten as breakfast. Keep the sweeteners natural by using honey, agave or maple syrup, serve with fruit, and you have yourself a decadent treat that is just as healthy as it is delicious. If you’re anything like me, you steer clear of pudding recipes because the long process and the imminent burning-of-milk. In a typical pudding recipe, one must heat milk and temper eggs, leaving a lot of room for error. With chia seed pudding, all you need is your ingredients and a jar – no cooking required! Simply mix your ingredients together, and let it sit in the refrigerator overnight. The next morning, you will have chia seed pudding waiting for you for breakfast! I love adding sliced fruit (bananas are my favorite) to make the chia seed pudding even more tasty. The convenience of a no-bake dessert with a 30 second prep time is wonderful for the times we get busy. Healthy desserts that are low on the glycemic index tend to require some thought, energy, and preparation, but this one is truly a no-brainer. There is no time commitment involved, there is no end to the health benefits, and the result is delicious! Looking for another awesome vegan breakfast? Don't miss Ashton's Vegan Pancakes Recipe! Add almond milk, maple syrup and chia seeds to a jar and stir well (or shake). In the morning, stir the pudding and if the consistency is not thick yet, place it back in the refrigerator for another hour or so. Preheat the oven to 375°F and spread the walnuts on a baking sheet. Roast the walnuts for 5 to 8 minutes, or until slightly browned and toasted. Pour pudding into bowls or glasses and serve with roasted walnuts and maple syrup on top. Add sliced banana, peaches, fresh berries or mango.